Professional translation can be expensive especially if you have a lot to translate. While there might be a temptation to start using automatic translation, in business use the machine translation quality is rarely good enough. Professionalism is an attribute that many companies would like to present but it comes only with high quality. Thus, if think you need to cut down your translation costs but don’t want to sacrifice the quality, you should follow these three steps. Translations are often charged based on the amount of words. This means that eliminating the amount of words decreases the costs. Every company should have all the power over their content, so this step is quite simple. The easiest method is to start eliminating duplicate content. Most manuals have similar content across different text sections or product versions. Most manuals have somewhat similar content than web pages. Most web pages contain same kind of information as brochures. And so on. The key is to find these duplicates. One way to manage content in various documents and formats is to use modular environment for the information. This means that the content is divided into separate modules or pieces of text in a way that they are re-usable in various places and formats. The formatting and layout between different formats should be as automatic as possible because then the writer can concentrate on the content only. Uniform look will also improve the reader experience and brand image. Another step towards a clever translation and content management is to take a look at the writing style. Simplified style will reduce the amount of words that are there just for style reasons. Deleting all additional words decreases the total costs when utilizing the price per word pricing model. Of course there are some materials, like brochures, that need to be reader friendly and stylish, but there are also other types of texts, like user manuals, that have to teach more than entertain. Typically short and clear sentences with limited and topic related vocabulary deliver the message very well. Simplified language also minimizes the risk of misunderstanding when the readers don’t speak the language as their native language. The third way to rationalize translation cost is to write own dictionary for the industry specific vocabulary. This saves translators’ time and improves the quality. A glossary can be used like a translation memory with a translation tool to automate the translation work. The saving is especially remarkable if there are some words or phrases repeated several times across the documentation. Unified vocabulary guarantees that the quality will be consistent in all languages. 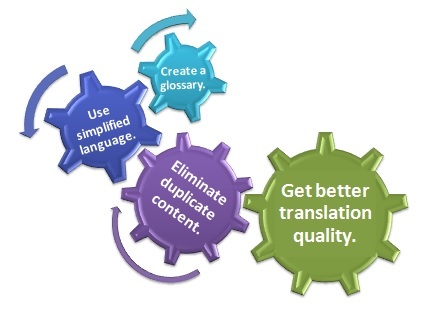 These three steps help you to rationalize the translation needs. The input affects the quality of the output also when talking about translations. So even if you don’t have to decrease translation costs, you should consider editing your material once more time before handing it to the translator. It will be beneficial to everyone. Localize all your content with one tool. Learn more about Multilizer localization tools for software, document and content localization.